In the Senate elections, neither party made gains, as Republicans won Senate seats from Illinois, Kentucky, and Ohio. Democrats won seats in New York, North Carolina, and Indiana. 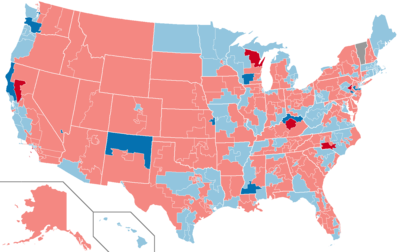 The parallel House of Representatives elections saw a significant disruption of the historic six-year itch trend, where the President's party loses seats in the second-term midterm elections, as the Democrats picked up 5 seats in the House. This also marked the second time in U.S. history since the Civil War that the President's party gained seats in a midterm election, the first being 1934 and the third being 2002. This is also the only time this has happened during the president's second term rather than their first. ^ "Statistics of the Congressional Election of November 3, 1998" (PDF). U.S. House of Reps, Office of the Clerk. Retrieved 10 April 2017. ^ a b Busch, Andrew (1999). Horses in Midstream. University of Pittsburgh Press. pp. 145–148.